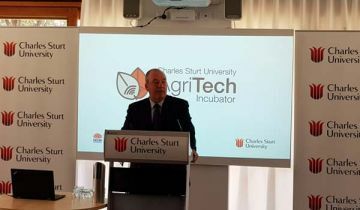 Agricultural businesses across the Riverina are set for a major boost following today’s launch of an AgriTech Incubator Hub at Charles Sturt University’s (CSU) Wagga Wagga campus. Member for Wagga Wagga Daryl Maguire said the Hub, which is supported by the NSW Government, will bring university researchers together with technology and business entrepreneurs to create new products and ideas for the agricultural sector. “This exciting new addition to the Riverina economy will help start-ups as well as small to medium-sized enterprises (SMEs) develop Agritech innovations, by giving them access to the incredible knowledge and resources housed within CSU,” Mr Maguire said. “The AgriTech Incubator Hub has been developed with assistance from the Government’s Boosting Business Innovation Program which is providing $1.5 million to each of NSW's 11 universities – including Charles Sturt - and the CSIRO. “The aim of the program is to drive innovation and develop new ideas by bringing our best business and academic brains together. “Digital technologies are transforming agriculture, and the new AgriTech Incubator Hub will ensure our regional businesses are operating at the forefront of those developments. “Located in a newly refurbished building at the University’s Wagga Wagga Campus, the Hub is now open for business as a co-working and meeting space,” he said. CSU Professor of Food Engineering and leader of the AgriTech Incubator, John Mawson, said the Incubator will draw on the University’s deep heritage and research base in agriculture and food production to support business development and growth. “The University laboratories and field facilities, and our formal links with many regional farming systems groups, provide the opportunity to evaluate and develop innovations under real-world conditions,” Professor Mawson said. The launch for the AgriTech Incubator program was at the Hub’s new premises in building 6 at CSU in Wagga Wagga this morning.